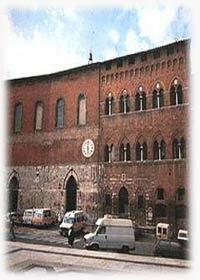 The big area of Santa Maria della Scala (350.000 mt cube), built in the 12th century, was infact the oldest hospital in Europe, now the numerous rooms are used as a museum. The most famous room is The Sala del Pellegrino, with its 15th century frescoes depicting ; " the history and life of Santa Maria della Scala" painted by Domenico Bartolo. Almost of the greatest Senesi's artists worked for the "Santa Maria della Scala ", for this reason this is considered the third artistic pole of the city , togheter with "Palazzo Pubblico" and "The Cathedral"(near Santa Maria della Scala ) .